Haruki Murakami’s novels arrive with the screaming momentum of their author’s enormous reputation. A perpetually-mentioned name where the Nobel Prize for Literature is concerned, Murakami this year withdrew from consideration for the New Academy Prize, the alternative-Nobel, claiming he wished to concentrate on his writing (the prize was subsequently awarded to Maryse Condé). His works are known for being challenging, delightful explorations of apolitical magic realism. 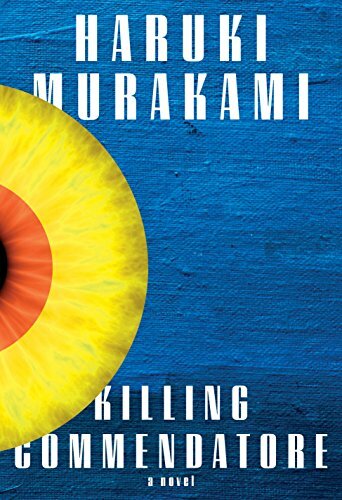 Killing Commendatore hurtles through the atmosphere of Murakami’s prestige but alights with little of his usual cat-like grace (and, perhaps relatedly, almost none of his beautifully-rendered cats). The novel’s protagonist, an unnamed portrait-painter, is cast out by his wife and left to his own devices. He travels the country in a run-down car before taking shelter in the home of a renowned artist, now dying elsewhere in air-conditioned comfort. The portrait painter teaches art classes, has affairs with married women, and fails to paint for himself. His unmoored life finds its current when he receives a commission to paint the portrait of an impossibly wealthy man living on the next mountain over. The only caveat: He must paint with his subject present, counter to his established habit. So arrives Mr. Menshiki (his name, rather pointedly, means “avoiding color”). Menshiki’s agenda for the portraitist leads them both to another neighbor who may or may not be Menshiki’s daughter. A temporarily-embodied Idea leaps into the portraitist’s world as well, taking its form from a painting created by the house’s owner. This Idea, the Commendatore, is the book’s strongest element. Murakami’s magical elements carry his greatest enchantment. Haunted by Ideas, hunted by double metaphors, the portraitist staggers through a literal symbolic quest (a quest into the land of symbolism) which disrupts the landscape and opens countless possibilities. If quest were the core of the novel, the novel would be magnificent. But Killing Commendatore is untidy and sprawling. Murakami’s interest in the details of ordinary life heightens into an obsession, with the cooking habits of a man ostensibly uninterested in food exhaustively explicated. No character can appear without a full clothing inventory, including color, styling, and fabric choice. The same opera recordings (on vinyl, of course) play over and over again. Even by those standards, though, Killing’s women come off badly. Every female character is described first in terms of her breast size. The only female characters who don’t become sexual partners for core male characters are Menshiki’s potential daughter, who escapes by being 13 and breastless, and the portraitist’s sister, who is dead (at 13, but with developing breasts). The daughter clearly understands that her age and lack of mammary tissue are tragic. Her breast development is her major obsession. She discusses it at length with the portraitist, who is her art teacher and decades her senior, as well as a near-stranger. These scenes are grotesque to the point of parody, but parody doesn’t seem to be Murakami’s purpose. This isn’t Nabokov’s metafictional obsession with the prepubescent female body; if the breasts are, as Murakami seems to insist, “Double Metaphors,” they function so only in the most basic fashion, grotesquely, and without grace. The portraitist’s paintings are more engaging in this book than any woman who scratches her way into the text. The paintings’ grasp of meaning and personality, possibility and danger, launches half-dried canvases into the world as powerful, autonomous entities. The book is less successful than any of the paintings in it. Where the paintings lurk unfinished and revealing, Killing Commendatore is over-written and obtuse. Murakami has written far better books than this one. Newcomers to his work should instead pick up Kafka on the Shore or Hard-Boiled Wonderland and the End of the World.